Earned a nice stash of points using travel rewards credit cards? Now comes the fun part. Or at least, it should be fun. You've got the potential to save thousands of dollars on airfare. But in reality, booking award travel can be a challenge. The airlines don't make it easy to search for available awards at the lowest mileage levels. Award searches on their websites are often slow, incomplete, and inaccurate, as they have little incentive to improve your chances of finding a free flight. And if you have points that transfer to miles with several different airlines, it can be difficult to search all of the possible options. Thankfully, there are third-party tools that can help you use your miles to reach your destination. Each provides functionality that's missing from the airlines' websites. First, we'll tell you about four tools, then we'll give you some tips for making award booking easier. Expert Flyer is a very powerful tool that can help you search award space across many different airlines. It's meant for travelers who want access to the data that the airlines conceal behind their clunky interfaces. You can set up a free account and get seat alerts that let you know when a particular type of seat is available on a flight for which you're already booked. This service can help if you're trying to move from a middle seat to a window or aisle on a full flight, but it doesn't go beyond that. Expert Flyer's real value comes with its pro subscriptions. For $4.99 per month, a basic subscription allows you 250 queries per month across 400 different airlines. You can search for award seats, upgrades, and revenue flights. The premium version is available for $9.99 per month or $99.99 per year and includes unlimited searches, and flight availability alerts that notify you when award space becomes available. It will also allow you to search for flights during a six-day period and to save queries for repeated use. You'll get access to a mobile app, too. Award Nexus specializes in finding business and first class seats, or awards with complex routings. A free account is available for members of the online forums Flyer Talk and Inside Flyer (previously Milepoint), but it offers limited access. For more extensive access, the website offers three memberships, including premium basic for $59, premium advanced for $129, and premium expert for $249. Each level buys you a certain number of points. Each point is worth one search on one airline website for one day in one class of service. The tool allows you to specify which airline websites or alliances you'd like to search. You can search up to plus or minus seven days from a specific flight date. And you can get notifications when award seats become available. The main advantage of Award Nexus over Expert Flyer is that it includes more airlines, such as Cathay Pacific, which isn't included in Expert Flyer. The interface for the KVS Tool website and the downloadable program it provides is ugly, and using the tool involves a learning curve. But for the frequent traveler, it might be worth the trouble and cost. The tool allows you to search for seats across each of the major airline alliances, as well as some independent airlines. Or at least, that's what the platinum and diamond memberships do. The platinum membership has limited award search capability and starts at $15 for two months, while the diamond package starts at $20 for two months. It includes about double the airlines of the platinum subscription, as well as a 30-day award availability power search and access to the mobile companion app. The main benefit of the KVS Tool over some of the other tools listed here is that it allows very detailed, comprehensive searches. Do you have credit card or other points with a program that allows you to transfer your points to a frequent flyer program? If so, it can be very difficult to sort through all the possibilities to find the best award. Award Hacker is a free website that can help by listing all of the available awards from dozens of different frequent flyer programs, and the rewards programs that you can transfer from. For example, you might be able to transfer your Starwood Preferred Guest points to JAL and book an award ticket on an American Airlines flight for fewer miles than if you had transferred the miles to American itself. However, this tool doesn't tell you if a flight will have award seats available, or if the airline will impose an expensive fuel surcharge. It will only tell you the least number of miles needed for an award, if available. 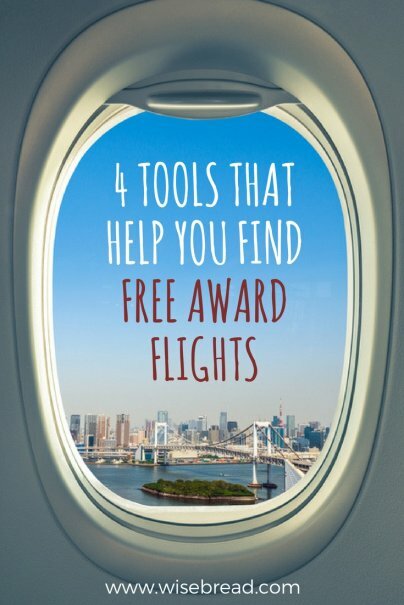 Beyond the tools listed above, we've got a few other tips for finding award flights. While you can pay to use a tool, you could first try to search certain airline websites yourself. The trick is to understand which websites can best find award seats on the airlines in a particular alliance. There are three major airline alliances: Oneworld, SkyTeam, and Star Alliance. Oneworld includes 13 airlines, such as American Airlines, British Airways, and Qantas. American's website will search most, but not all of these carriers, so you might want to use the British Airways or Qantas websites to find award flights on the airlines that don't appear at AA.com. SkyTeam includes 20 airlines, such as Delta, Air France, and Korean Air. The easiest website to search for award seats is the Flying Blue website of Air France, KLM, and others. Star Alliance includes 28 airlines, such as United, Air Canada, and Lufthansa. United's website allows you to search most of these carriers' award flights, but never shows seats on Singapore Airlines. To fill in that gap, try the website for Aeroplan (Air Canada), ANA, or the Singapore Airlines site itself. Even experienced award travelers can search for hours to find the right flights, and it can be nearly impossible for beginners to be successful at finding scarce award space. Instead of trying to do it themselves, many travelers prefer to use award booking services. For a fee, you can hire a true expert to do all this searching for you and come up with the best options. Fortunately, most award booking services will only charge you when they can find a flight that meets your needs.